Graying of hair is not an unusual thing to happen. The age when graying starts depends on one's genetic inheritance. Aging is often a reason that causes the hair to turn grayish. But premature graying of hair is a condition that demands the need to pay attention to the root cause. Nonetheless, graying of hair is a normal part of the aging process unless there is an underlying medical condition that is causing the lack of pigmentation. Persons suffering from chronic cold and sinusitis and those who use warm water for washing their hair are more likely to be victims of this condition. A faulty diet and mental worries are the two primary causes of premature greying of hair. Lack of some of the B vitamins, iron, copper, and iodine in the daily diet is said to be a contributory factor. 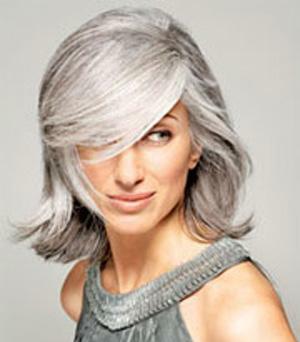 The common factor remains that grey hair has some pigment left in it, but not the amount it had when it was the natural color Other causes of premature greying of hair are an unclean condition of the scalp, washing the hair with hot water, drying it with an electric dryer, and use of hair dyes. Heredity is also a predisposing factor. Amaranth is another effective home remedy for hair disorders. Application of the fresh juice of the leaves of this vegetable helps the hair to retain its black color and prevents it from premature graying. It also helps the growth of the hair and keeps it soft. Premature Greying of Hair treatment using Indian Gooseberry. The use of Indian gooseberry is the foremost among the home remedies found beneficial in the prevention and treatment of premature greying of hair. This is a valuable hair tonic for enriching hair growth and hair pigmentation. Liberal intake of curry leaves is considered beneficial in preventing premature graying of hair. These leaves have the property of providing vitality and strength to hair roots. New hair roots that grow are healthier and contain a normal pigment. The leaves can be used in the form of chutney, or may be squeezed in buttermilk. When the leaves are boiled in coconut oil, the oil forms an excellent hair tonic to stimulate hair growth and bring back hair pigmentation. The role of proper diet in preventing and arresting premature graying of hair is very important. Eating a lot of fruits and vegetables is absolutely essential to facilitate the supply of essential vitamins and minerals.